Halo's founder, Bill Schmid and his wife lost their first born to SIDS. From this tragedy, HALO and its mission were born. Today, HALO SleepSack Wearable Blankets are the number 1 trusted choice of hospitals and are used to help babies sleep safely from the start. In addition to sleeping safer, it helps babies sleep better, too. 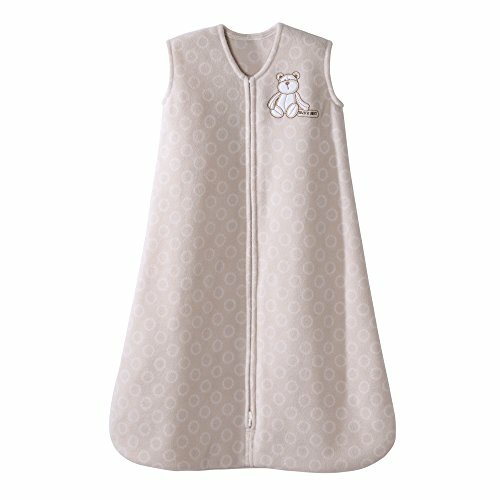 It's a warm cuddly blanket they can't kick off; ensuring baby sleeps soundly throughout the night, with a unique, roomy sack design recognized by the International Hip Dysplasia Institute as "hip healthy." Inverted zipper opens from the bottom for easy diaper changes; sleeveless to reduce the risk of overheating; arm and neck openings sized for a safer fit. HALO donates a portion of every purchase to First Candle/SIDS Alliance and The Canadian Foundation for the Study of Infant Deaths. Made from super-soft micro-fleece polyester fabric with a TOG rating of 1.0, this Sleepsack offers just the right comfort for moderate seasons or climates, and can be layered with warmer sleepwear for cooler temperatures. Micro-fiber construction makes it extremely soft and durable, perfect for baby sleepwear. Size Small is designed to fit babies weighing between 10 and 18 pounds, who are generally 0 to 6 months old and 23 to 26 inches long.